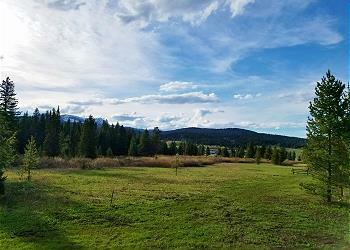 Just 7 miles from West Yellowstone's entrance to Yellowstone National Park. 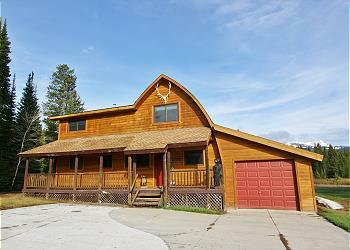 Stunning views of Lionhead Mountain and the Continental Divide. Walk to Forest Service trails, make the short drive to Hebgen Lake, or check out the many fishing access sites around the area. 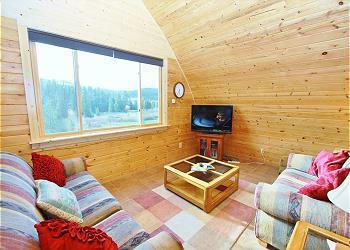 The Cabin offers satellite internet access. 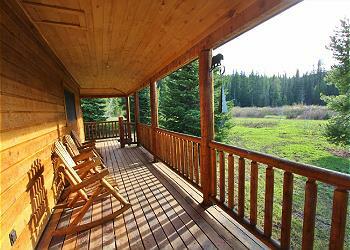 BRIEF DESCRIPTION: Red Cedar Cabin is a great base for exploring the whole Yellowstone area. 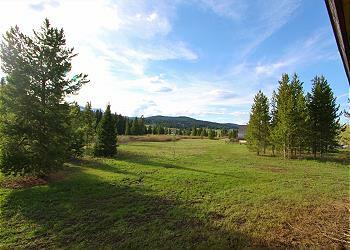 It’s just 7 miles to the town of West Yellowstone, a Yellowstone National Park entrance. 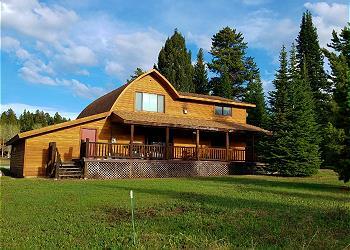 The home is surrounded by national forest trails for hiking, mountain biking, and snowmobiling. It's also just a short drive to a quiet cove on Hebgen Lake, as well as to Henry's Lake and both the Madison and Henry's Fork Rivers for fishing. 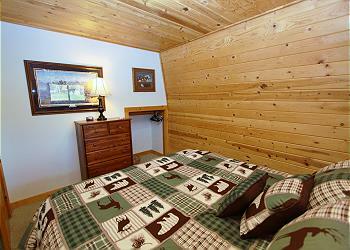 BEDROOMS AND BATHS: The lodge has five bedrooms and five baths. 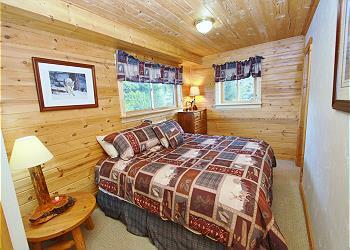 The main level has two bedrooms, each with a king size bed. One bedroom has an en suite bath with shower. There is a hall bath for on the first floor as well. The upper level has three bedrooms, two with king size beds and en suite baths with showers, and one with three twin beds. This last bedroom uses a bath with shower that's just out in the hall. 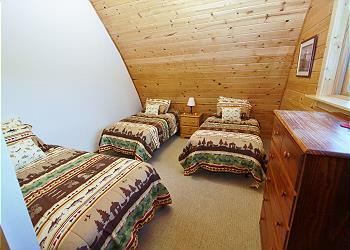 Lastly, there is an additional sleeping alcove (no door) with a twin bed just off the main level sitting room. There is additional sleeping on two roll away cots and the home also comes equipped with two portable cribs. 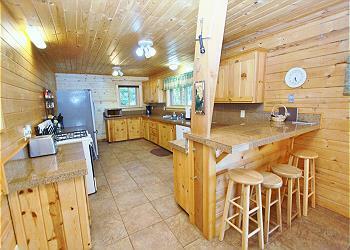 KITCHEN: This is a great kitchen for a crowd as it opens to the bar, the dining area, and the living room. It’s equipped with all stainless appliances, a smooth top electric range, tons of serving and picnic ware, and lots of small appliance extras like a crock pot, two coffee pots, an electric mixer and a blender. DINING AREA: The large dining table seats twelve comfortably and the bar accommodates another four. There’s also plenty of seating for enjoying outdoor meals out on the covered porch and on the picnic table in the back yard. 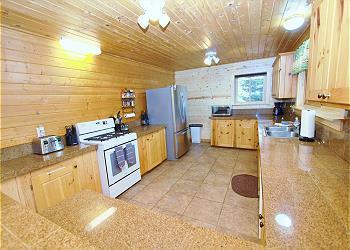 For outdoor cooking, the home has two propane barbecue grills on the back deck. LIVING ROOM: The cozy living room, which is on the upper level, has a gas fireplace, a flat screen HD TV with satellite service, and comfy seating. SETTING, ACREAGE, AND VIEWS: Red Cedar Cabin is in a woodsy vacation home neighborhood about 7 miles from West Yellowstone, which is the West entrance to Yellowstone National Park. 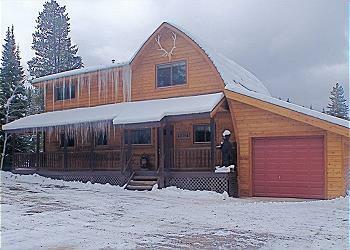 It sits on one acre and enjoys incredible views of Lionhead Mountain and other peaks along the Continental Divide. You’re likely to see elk, moose and maybe even a bear in this beautiful wild area! OUTDOOR AMENITIES: Decks on three sides of the house provide room for enjoying coffee in the morning sunshine and then sunset over the mountains. CLOSEST TOWN AND AIRPORT: You are 7 miles from the town of West Yellowstone, 90 miles from Bozeman’s Yellowstone International Airport and 110 miles from Idaho Falls, Idaho. ACTIVITIES NEARBY: In winter, you can snowmobile right from the house and get onto hundreds of miles of groomed snowmobile trails. If you prefer Nordic skiing, West Yellowstone’s Rendezvous Trails are a short drive away and you can explore Yellowstone Park by snow coach. In summer, there’s hiking and mountain biking right out the door, fishing on blue ribbon streams, boating on Hebgen Lake and of course – day trips into Yellowstone Park. It was a very enjoyable setup for 11 people. The cabin was very spacious. 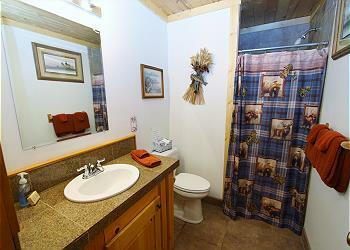 There are 3 bedrooms with full on suite baths. And another 2 shared full baths. Large showers with hot water. 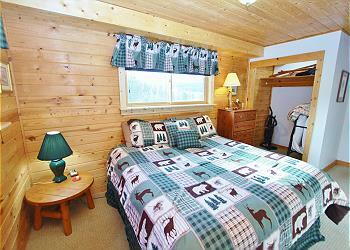 There were 4 bedrooms with comfortable king beds. 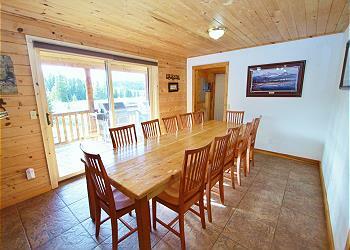 A great big kitchen with a large dining area and a dining table for 14+ people. The upstairs living room with couch and TV is very cozy. We enjoyed playing card games at the table. 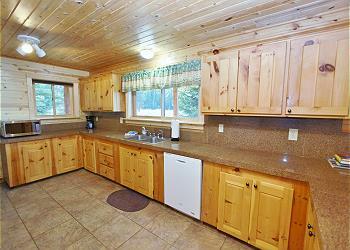 There is a stocked kitchen with utensils, plenty of dishes, cups, pots and pans,Tupperware and much more. I just wished that the web site listed the kitchen items so we would not have taken items we did not need. If you like to cook you will have all the needed items to do so. Large refrigerator and a dishwasher. 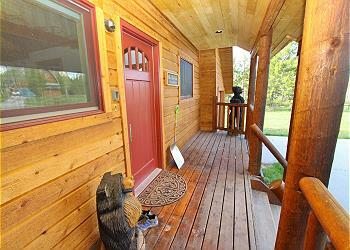 The view from the kitchen and dining area overlooking the porch is really beautiful. It is also located close to the YellowStone entrance. The driveway was scraped so that parking was not a problem with all the snow. The yard was large enough for us to play in the snow. 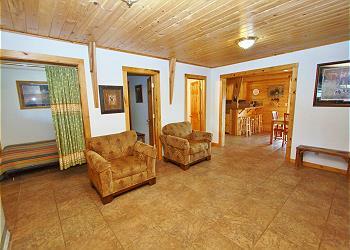 It had a great log cabin feel with great amenities. We also enjoyed the moose that came to visit the neighbors. Loved it and my whole party enjoyed it!!! I would give the house 5 out of 5stars. Hello Judy, We appreciate you mentioning how well supplied that kitchen was. 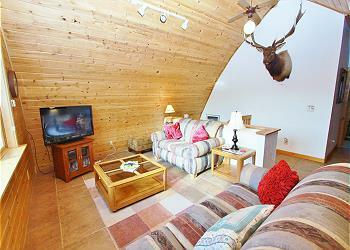 This is something you can expect from any property managed by Mountain Home! We hope our guests can pack light and really relax and enjoy our special selection of homes and their beautiful surroundings! It was a very comfortable setup for 12 people plus 1 kid. 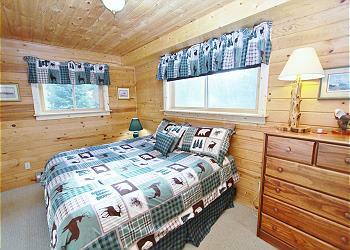 This cabin very spacious. 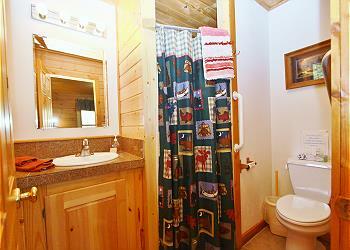 There are 3 bedrooms with full onsuite baths. And another 2 shared full baths. Large showers with hot water. 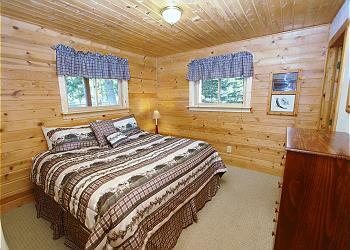 There were 4 bedrooms with comfortable king beds & 4 single beds. 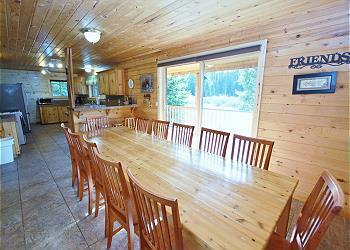 A great big kitchen with a large dining area and a dining table for 14+ people. The upstairs living room with couch and TV is very cozy. We enjoyed having a game night in this area. 2 grills available and a well stocked kitchen with utensils, plenty of dishes, cups, pots and pans,Tupperware and much more. If you like to cook you will have all the needed items to do so. Large refrigerator and a dishwasher. 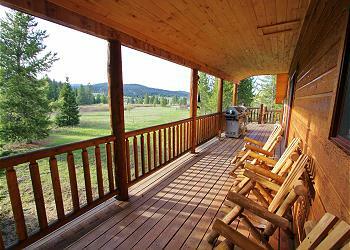 The view from the kitchen and dining area overlooking the porch is really beautiful. It is also located close to YellowStone entrance. The driveway is super long for plenty of cars to park in. We had 4 cars and still had plenty of room to spare. A nice little swing in the backyard was a great way to enjoy morning coffee and was entertaining for kids. 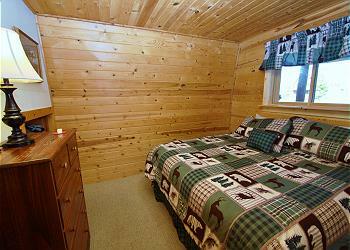 It had a great log cabin feel with great amenities. Loved it and my whole party enjoyed it!!! Very comfortable setup for 12. Our kids and grandkids really enjoyed the space. The view from the back porch is stunning. There was an Osprey nest in the trees and we were able to watch it with our binoculars. Quiet and dark for good star gazing and very close to Yellowstone. Everything we were hoping for. Spotlessly Clean, Fully Equipped, Fragrance-Free and Oh, Those Wonderful Sheets! Our Large Family Enjoyed Young Deer, Terrific Scenes, along with Peace and Quiet! Thank you Mountain-Home!! !